The Book Rat: Zombie Teaser: Hater by David Moody + upcoming appearance from the author! 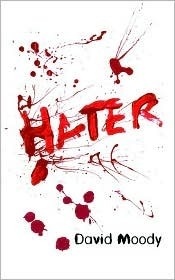 Zombie Teaser: Hater by David Moody + upcoming appearance from the author! Hate that this has to end so soon? Don't beat yourself up -- or anyone else, for that matter. There's a review of Hater coming up during Helluva Halloween. And what's that I see? Is that a book or two from David Moody -- for you? This was so freaking cool! I can't wait to get the full review. Ahhh, awesome. Looking forward reading your review! What an adorable header and blogname. Love the colors and design as well. great teaser. hadn't heard of this one before. looking forward to it next month! and we're treated to zombiette misty again. coolio. Love the cover and love your makeup! Clever girl! Love the trailer! I can't wait to read this one! sonds like a tense, scary book.